This article is about the geological formation. For other uses, see Mesa (disambiguation). Mesa ( Spanish, Portuguese and Sardinian for table) is the American English term for tableland, an elevated area of land with a flat top and sides that are usually steep cliffs. It takes its name from its characteristic table-top shape. It may also be called a table hill, table-topped hill or table mountain. It is larger than a butte, which it otherwise resembles closely. It is a characteristic landform of arid environments, particularly the Western and Southwestern United States in badlands and mountainous regions ranging from Washington and California to the Dakotas, Wyoming, Utah, Oklahoma, and Texas. Examples are also found in many other nations including Spain, Sardinia, North and South Africa, Arabia, India, and Australia. The differences in strength of various rock layers is what gives mesas their distinctive shape. 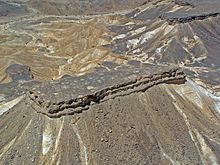 Less resistant rocks are eroded away on the surface into valleys, where they collect water drainage from the surrounding area, while the more resistant layers are left standing out. A large area of very resistant rock, such as a sill may shield the layers below it from erosion while the softer rock surrounding it is eroded into valleys, thus forming a caprock. Basal sapping occurs as water flowing around the rock layers of the mesa erodes the underlying soft shale layers, either as surface runoff from the mesa top or from groundwater moving through permeable overlying layers, which leads to slumping and flowage of the shale. As the underlying shale erodes away, it can no longer support the overlying cliff layers, which collapse and retreat. When the caprock has caved away to the point where only a little remains, it is known as a butte. 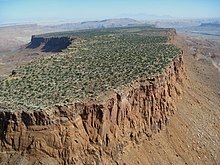 Potrero (landform) – A long mesa that at one end slopes upward to higher terrain. Wikimedia Commons has media related to Mesas. Look up mesa in Wiktionary, the free dictionary. ^ a b c d e f Easterbrook, Don J. (1999). Surface Processes and Landforms. Upper Saddle River, NJ: Prentice Hall. ^ Choreley, Richard J.; Stanley A. Schumm; David E. Sugden (1985). Geomorphology. New York: Methuen. ^ Baker, David M. Morphological Analyses of Mesas and Knobs in the Northwest Fretted Terrain of Mars; Constraints on the Presence and Distribution of Ice-Facilitated Mass-Wasting. Ed. Alexander K. Stewart and James W. Head. Vol. 40. Issue 2. pp. 72. United States: Geological Society of America (GSA) : Boulder, CO, United States, 2008.